New and beautiful. The new mini dirndl in 58er skirt length and the colour navy blue inspired by a clear design and traditionally strict lines. The dirndl is worked in blue print optics and printed with fine modified flower motives. The mini dirndl is high-necked and is in the style of the former working dirndl, which had the same shape. 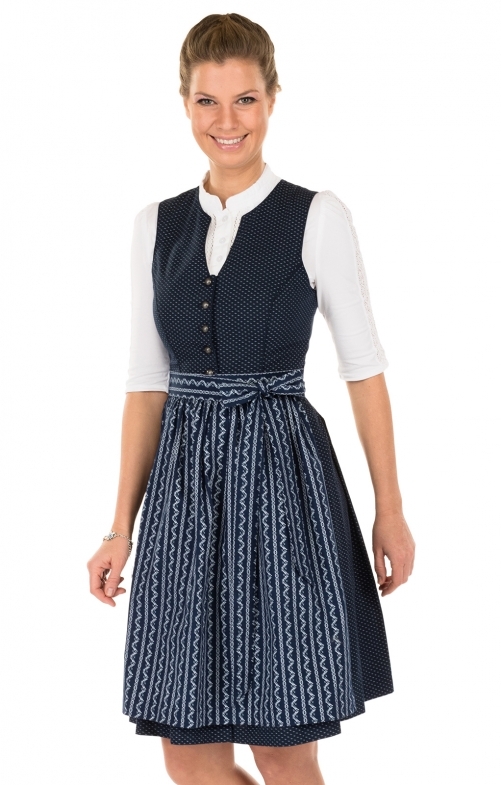 The semi-circular matte metal buttons not only close well, but fit perfectly with the style of this simple and hearty short dirndl. The dirndl apron is also made according to traditional apron design and skilfully rounds off the image of this "mother of all dirndls".